Behaviors add extra capabilities to objects. All objects can have one or more behaviors attached to it. Add behavior to an object. 1. Mouse click on the three dots in the Objects menu located to the right of the scene. Select “Edit object” from the popup listing. 2. Right mouse click on the object within the scene. Select “Edit object” from the popup listing. You should see the properties of the selected object. Ignore the properties tab for now. Select the “Behaviors” tab on the bar. 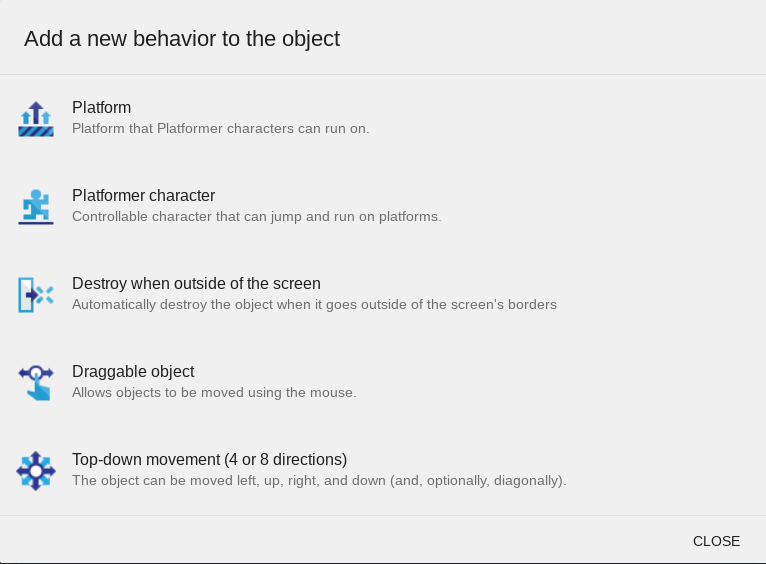 Here you will see a list of behaviors added to the object. It is probably empty now. 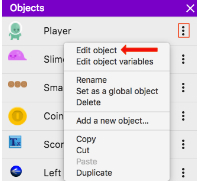 To add a behavior to the object, click the Add behavior button. Next you should see a list of available behaviors. You may need to scroll down to see the full list of behaviors. Finally, just click on a behavior to add that behavior to the object.